NEXT | The Queue: What's the deal with Rossi? It’s hard to decipher what’s going on in the Star Wars: Episode IX teaser trailer. Luke Skywalker talks about passing down “all we know” and says that “no one’s ever really gone” as the camera locks to our heroine Rey. The trailer even ends with the laugh of Emperor Palpatine — a villain who has been dead since 1983’s Return of the Jedi. 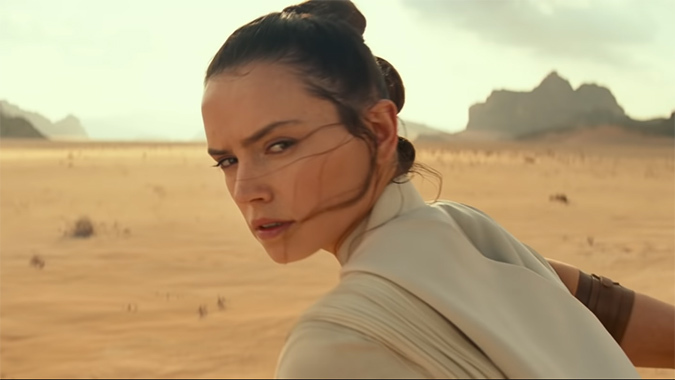 So with a title like The Rise of Skywalker, we’re left wondering what any of this means for the final entry in the latest trilogy of films. Some suspect that the title and the teaser’s hints means a retcon is coming for Rey’s Skywalker ancestry or that director J.J. Abrams is employing a massive misdirection. It would be disappointing to see the film upend the work that Rian Johnson did with 2017’s The Last Jedi. In it, Johnson made clear that Rey’s parents didn’t matter; she was strong and important regardless of where she came from. The Rise of Skywalker — which is due out December 20th — could remove all of that, or turn “Skywalker” into a title of sorts. None of this is clear in a two minute trailer, but it does raise some big questions. Less confusing are the shots throughout the trailer that confirm some smaller parts of the puzzle, with plenty of references for fans to try to decipher. We see Rey holding Luke Skywalker’s lightsaber. Kylo Ren’s shattered helmet is welded back together with red, jagged lines all over it. Lando Calrissian is back. BB-8 is also back, but with a new droid buddy. And our three heroes — Rey, Finn, and Poe Dameron — are all staring at a horizon clouded by a fallen Death Star. It’s a compelling teaser, filled with contrasting shots of Rey and Kylo — using blue and orange/red-ish hues no less. It’s tense and hopeful and then ominously leaves on Palpatine’s laugh. It’s packed with ideas and potential like any good trailer should be, but where it goes with all of this could turn out to be pretty divisive.